Oh forgive me. I didn't mean to sound like those annoying commercials (you do know what I am talking about I bet. They are everywhere). Ajajaja, Ok. Maybe I did. Just a little. Let's leave the drama behind now, yes? Ok. Yes. Using Washi tape or an assortment of bright colored masking tape, create a stripped pattern using 2 or more colors and apply this to your entire luggage. Choose from an assortment of colorful ribbons and tie a large bow somewhere visible. The handles would be a great idea. This is super simple yet effective so the bigger the bow the easier it'll be to spot your suitcase. For you tea lovers out there, take the wrapping of your favorite tea and laminate the paper with strong, good quality clear tape, (2-3 layers on each side would be good) then trim the excess tape. 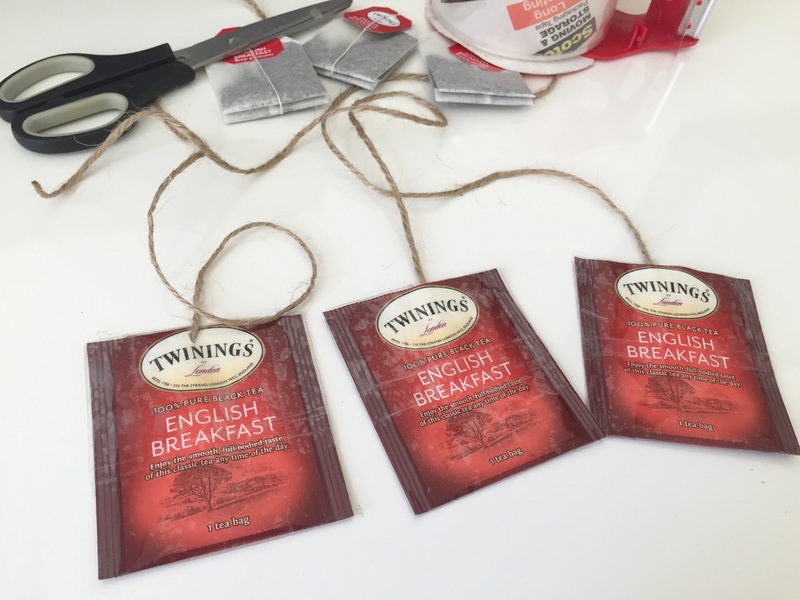 Attach a string sort of where your tea bag would have its string attached, and then secure it with more tape. Attach your tag. World globes can be a great way to have a "Travel Theme" going on to your luggage. Laminate a printed out version and once again create a unique tag. Favorite quotes. Whoever reads them will surely have a thought. The shorter they are the better, but that's just me. Make sure to choose a good decent size for the tag and for the quoted worlds. Create the design with Microsoft Word. Attach a piece of string to a small or tiny embroidery hoop and then to your suitcase. This is where you get to use up all those fabric scraps you have laying around or you can simply leave the hoop empty. This is very unique and absolutely adorable. I bet you no one will have this at the airport. Every time I visit Home Depot, I always come back with paint swatches in many colors. If you're like me and you have a couple laying around not knowing what to do with them, simply crop, (in my case it was not necessary as I prefer the larger chips) laminate them for extra protection and then poke a whole at the top, tie a string to it and finally attach your tag. Choose your favorite colors. The bottom line is to simply attach what you like to a string and then to your luggage. Or you might like a piece of fabric, so attach that. Whatever you choose to attach should not be heavy but virtually weightless. This is so that your suitcases don't add up unnecessary weight. Also, whatever you do to one suitcase do to the next as to keep a trend. Granted, there must be more black suitcases at the airport than any other color. My Samsonite Bartlett is one of them. I totally love the look of a black suitcase for its ability to match everything, looks clean and stylish and it hides imperfections like a charm. So I'm definitely not the girl sporting the wildest looking flower patterned luggage that can be seen from miles away, no, no. I stick to what I like. But it is so darn annoying while waiting at the carousel and all you see are black suitcases everywhere. Where is mine you ask? The one with.... hmm... the tea bag tag, huge bow, paint swatch tag? Honestly I could identify my luggage with any of these tags. I actually really enjoy the look of this, below. 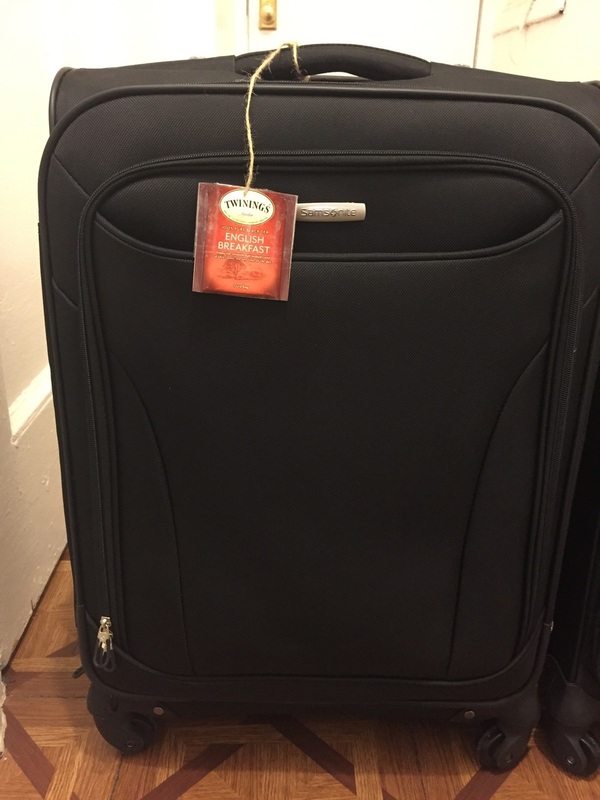 Check out my other travel related posts on How I Pack My Carry On Suitcase or my Checked Suitcase for a complement to this one. Hope this was helpful. What do you do to identify YOUR luggage?